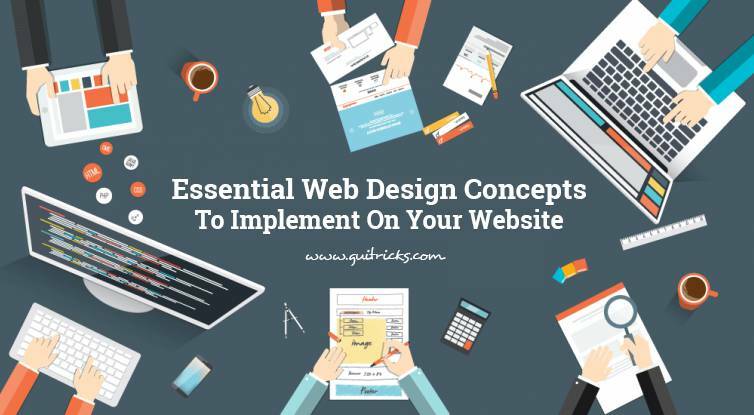 Essential Web Design Concepts To Implement On Your Website In 2018 | GUI Tricks - In Touch With Tomorrow! 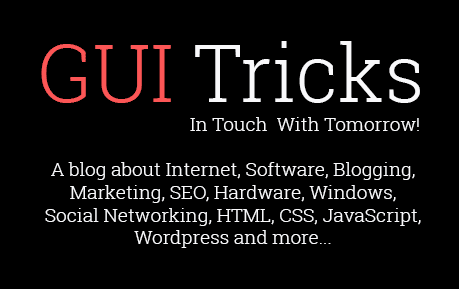 Essential Web Design Concepts To Implement On Your Website In 2018 - GUI Tricks - In Touch With Tomorrow! Whether you are new to web design or are looking for ways to update your existing site, following trends does matter. People are far more generous towards a website and tend to come back again if the managers are in touch with current technology and concepts. Given that we are in 2018 and that things in the design sphere change drastically and sporadically, you should always be on the lookout for improvements. That being said, what are some of the essential concepts and ideas that are shaping up to become predominant in 2018? Gone are the days of stuffing your website’s grid with unnecessary elements, buttons, hyperlinks and ads. Visitors tend to prefer seeing minimalist design solutions in the sites they frequent the most. The reason for this is mostly psychological. However, sites such as Google, Pinterest and even Tumblr have proven that minimalism works. This type of design makes information easier to find and navigation is faster and more streamlined – not to mention the speed of accessing said websites. If you want to ensure a good SERP ranking and come off as slick and professional, try to unburden your website from unnecessary elements that are clogging your layout. Using stock photos, online illustrations and royalty-free elements in your design is all well and good. However, if you want to attract a specific, niche audience to your website, you will have to do better than that. Users are keen on spotting new, interesting and attractive visual content in the websites they frequent. It’s always a good idea to keep an eye out for interesting web design solutions on sites such as Behance and 99designs. These sites are used by prominent designers as well as their clients. Seeing what the best people in your niche are doing with their websites is always a good starting point for your own content creation. Keep in mind that the style of your visual content has to coincide with the audience you already have and the image you have built up so far. Changing your visual identity and content overnight might not bode well for your traffic and leads. Emphasizing your visual elements through outlines and shadows can be a great way to lead your visitors through the site itself. Using visual signs to guide the eye through a page is an interesting concept that is taking shape in 2018. This design principle is especially present in websites that opt for using plain backgrounds with pastille colors – sometimes even completely white! It all depends on what kind of an impression you want to induce in your visitors’ and their perception of your site. Try using shadows and outlines on your visual elements in very subtle and careful ways. The colors you use in these elements should match the already existing hierarchy of visual elements present on the site. 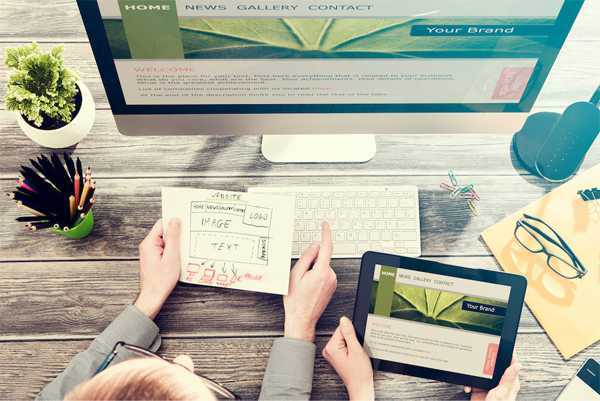 Building a responsive site differs to what many people think. Responsive design means that your site is ready and able to be used on multiple different screens, devices, browsers, etc. It “responds” to the user and their access point by allowing for a more enjoyable and optimized experience. With the growing percentage of internet users being on mobile devices instead of computers, it’s easy to understand why making your website responsive should be a priority. By not doing so, you effectively cut out a large portion of possible visitors. Google and its SEO will quickly deduce whether your site is mobile-friendly and rank you accordingly. Don’t make the mistake of thinking you can outsmart SEO algorithms and prepare your site for the mobile revolution in 2018. While the content you create doesn’t strictly fall under web design it’s still an important part of the whole. A good web design without any content to back it up doesn’t serve a purpose. It’s often better to have mediocre web design elements and good content, whether guest posts, blogs or other forms of it. One of the most popular options is delegating the content creation process to a third-party (if you don’t have an internal writing staff). A good option that many refer to is TrustMyPaper, a site that specializes in different types of writing. The professional writers are capable of delivering SEO optimized content relevant to your audience depending on your niche. All you have to do is prepare clear instructions and wait for the materials to arrive. This type of collaboration is the new norm in 2018, where the information is expected to arrive momentarily and only holds the readers’ attention for brief several minutes. Simply put, negative space represents every pixel on your website without any elements attached to it. The only things a negative space can have are background textures or color overlays – everything else is considered a positive space. What this means is that negative space can and should be used to convey important information on your pages. You can use negative space coupled with bold, large typographic elements to emphasize different places on each page. This type of psychological navigation is a great way to attract new users to your site even if you haven’t localized it (yet). We all think the same even though we use different languages – something that negative space doesn’t care about. The more negative space you feature on your website, the more confident and professional your site will appear to new visitors in 2018. If you can’t afford an illustrator or a graphic designer of your own, why not use typography instead? There are many free fonts on the web that you can safely implement in your web design layout without changing anything beforehand. The trick to using typography as a visual element is to carefully compare each font to your existing layout, elements and navigation. Placing a massive letter “V” or an “O” as a background with a subtle pattern on top makes for a very relaxing and enjoyable visual experience for readers. You can also create unique combinations of famous quotes with distinct fonts that you can discover by searching sites such as FontSquirrel or DaFont. This simple example can be taken further if your web designer and you have just a spark of imagination. While others pay hundreds of dollars for custom-made illustrations, you can go the easier and cheaper route by implementing typography as an illustration by itself. The last couple of years have witnessed a resurgence of static websites and landing page design solutions where all the information is present at once. This type of design is not viable in today’s climate of mobile web browsing where less and less people use big widescreen monitors to browse the web. Applying a scrolling bar to your web design solution and having a flow of information, top to bottom, is the way to go. You might think that you are able to place all the information you need in one window – but you really can’t. There will always be people that use phones with displays of only several inches. These users will effectively be cut out from your content (if they find your site at all due to SEO red flags you will cause). If you want Google and your readers to recognize you as a legitimate source of information or services, start using a scroll bar again. While the final decision does come down to your target demographic, you should always have a distinct and strict color pallet for your website. Placing random colors that might or might not work together won’t work, especially in 2018 where people are used to handcrafted website elements. Try using a color wheel to match several colors that might work together and try applying them to different elements in your layout. Pairing these colors with images, illustrations, text or other content will give you a good indication of whether or not you are on the right track. You can use your visitors as a test group (with a non-disclosure agreement notwithstanding). However, your web designer should be able to find a good solution to your color pallet issues with a couple of useful online tools (which are also completely free). Lastly, all of the above elements should come together to form a cohesive whole. If your visitors can’t make ends meet once they arrive at your landing page, all of the work you put in will be for nothing. Your navigation bar, hyperlinks and other interactive elements have to contrast the rest of your visual elements. Any and all decorative and illustrative elements that are in your web design layout shouldn’t intervene with the usability of your website. If these elements overshadow the important links and navigation buttons on each page, consider redesigning them or eliminating them entirely. The livelihood of your website rests on the shoulders of the abilities of your web designer. Start from the functionality of your site and move your way towards trending concepts that you can implement. Always assume that your visitors don’t know anything about web design and are just there to consume information or products on offer. Between the minimalistic design principles and typographic illustrations there is something to be found for every site manager. It’s up to you to make the best of what is on offer and raise your traffic by doing so in 2018.